Guy Liberte is the man behind the fantasy, who turned circus acts into magic and acrobatics into fairy tales when he laid the foundations of Cirque du Soleil. Accordionist by trade, a specialist in walking on stilts, and fire eater, Liberte and a group of 20 Montreal performing artists founded Canada's most successful export product back in 1984. Just as their slogans says, “we reinvent the circus,” Cirque du Soleil created a new niche, focusing on a new type of audience, where clowns became sophisticated and their numbers elaborated, all the while increasing the public's comfort. Furthermore, they added theater elements, each show with its own storyline and musical score, dedicated exclusively to the most skillful of human talents. Their shows thrilled over 40 million people from over 100 countries. What's even more spectacular is that in just 20 years, Cirque du Soleil grossed much more than other famous companies cashed within a century. The value of the enterprise exceeds $2 billion. Their state-of-the art headquarters in Montreal alone is worth $60 million. Cirque du Soleil makes over $800 million a year in ticket sales, exceeding $1 billion in both 2012 and 2013. With over 4,000 employees, including over 1,000 professional circus artists, their shows' dizzying heights, impeccable costumes, glamor, and distinctive refinement, a unique blend of acrobatics and theater, gave birth to the most expensive cirque extravaganza on Earth. What started as a touring show in 2011 was converted into a permanent Las Vegas circus performance in 2012 and immediately began cashing in millions. Cirque du Soleil's Zarkana is the company's third most expensive show to attend, and one of their biggest productions to date. Characterized by a unique set that is constantly moving, allowing the performers to shine, it features amazing visual effects, as images are projected onto LED screens, creating remarkable illusions of fire and snakes blending in with the artists' acrobatic talents. With the average ticket price of just over $200, Zarkana cashes in around $30 million in sales per year. Directed by theater director Dominic Champagne, Varekai premiered in 2002 in Montreal as a touring show. The storyline revolves around the Greek myth of Icarus, slightly altered to fit the spectacular acrobatic performances. The show, Varekai meaning “wherever” in the Roman language, is self-described as an “acrobatic tribute to the nomadic soul.” It cost $66 million to stage, and the set includes a forest with 300 trees, stage, catwalk, and lookout. The cast of 58 performers and the live music performed by seven musicians and two singers have thrilled over 6 million spectators so far. With tickets selling for around $70, Varekai grosses an average $160,000 per show, earning $30 million per year. Premiered in Montreal in 2007, Kooza signifies Cirque du Soleil's return to their origins, combining two priceless circus traditions, acrobatic performances and the art of clowning, all revolving around the main character, called The Innocent, who is in an endless search for a place where he can fit in. Kooza is Sanskrit for “treasure box,” and runs along ten acrobatic acts, written and directed by Davis Shiner, boasting colorful traditional circus inspired costumes. The touring show sells tickets for $70 per adult and makes an average $205,000 per show, grossing around $33 million per year. Based on the immortal East meet West theme, Dralion is based on various elements of traditional Chinese circus and contemporary Western circus. The name of the show is actually a portmanteau of “dragon” and “lion,” symbolizing the junction between the two worlds. There are over 1,500 wardrobe pieces, vibrant colored costumes inspired by traditional Indian, Chinese, and African clothing. Dralion started as a touring show in 1999. In 2010, it was converted into a format suitable for arenas. With an average ticket price of $88 per adult, each show cashes in an average $305,000. More than 8 million spectators worldwide have seen the performance, which cost a whopping $24 million to stage. One of Las Vegas' most beloved resident shows, Love premiered in 2006 at The Mirage. A cast of 60 international artists make the adored Beatles music shine through their awe-inspiring choreography. The Love Theater at The Mirage was built specially to host the show, which cost $100 million to stage. Revolving around the Beatles' musical legacy, with re-imagined music, it follows the group's journey to stardom. With average ticket prices hitting $200, Love grosses an average $60 million a year. Performed in a custom-built freestanding theater at Downtown Disney in the Walt Disney World Resort in Lake Buena Vista, Florida, La Nouba is a spectacular contemporary circus performance. The name is inspired from the French “faire la nouba”, meaning “to party” and that's exactly what the show is all about. Self-described as “dramatic mix of circus arts and street entertainment,” inspired by the Disney World itself, featuring over 1,200 lighting fixtures for each show, it counted its 7,000th performance in 2013. With an average ticket price of $200 per adult, the avant-garde circus show makes around $70 million a year in sales. Directed by Pierre Parisien, featuring an eclectic mix of music styles, Cirque du Soleil's Alegria revolves around two central themes: power and contrast. With darker music and lighting than other shows, it transmits a feeling of obscurity. Premiered in 1994, Alegria counted over 5,000 performances under its name, becoming one of the most popular touring shows ever. It cost more than $3 million to stage. In 2009, it was adapted for the arena and continues to tour America and Europe. Over 10 million spectators in over 65 cities throughout the world witnessed the performance, grossing an average $1.3 million per show. With an average ticket price of $100 per adult, it makes around $90 million in sales per year. With an average ticket price of $260 per adult, Cirque du Soleil's Michael Jackson ONE is the company's most expensive show to date. A stunning theatrical performance, it premiered in 2013 at Mandalay Bay Resort and Casino in Las Vegas, where the Michael Jackson Theater was specially remodeled to accommodate the performance. More theatrical, the second Michael Jackson inspired Cirque du Soleil show is written and directed by Jamie King, and is a transformative adventure, a theatrical evocation of the pop singer's creative genius performed on a soundtrack that includes 25 Michael Jackson tunes. Since its debut in May 2013, the show grossed over $100 million, making it one of the highest earning resident shows in America. Perhaps Cirque du Soleil's most spectacular resident show, O premiered in October 1998 at the Bellagio Hotel and Casino in Las Vegas. The rather unusual name of the show, O is pronounced as “eau,” which is French for water. Counting over 6,000 performances to date, the aquatic themed show revolves around a 1.5 million gallon pool and features remarkable synchronized swimming, high dive, and fire dancing. A cast of 85 acrobats give life to the performance housed by the fabulous O Theater, designed like a 14th century European opera house that can seat 1,800 spectators. One of the most popular shows in Las Vegas, O grossed over $1 billion since its debut in 1998, and sells tickets for an average price of $226 per adult. A unique combination of Michael Jackson's music and Cirque du Soleil's spectacular acrobatic performances, Michael Jackson: The Immortal Tour recreates the rock concert experience in one of the world's most successful touring shows, which premiered in 2011 in Montreal. 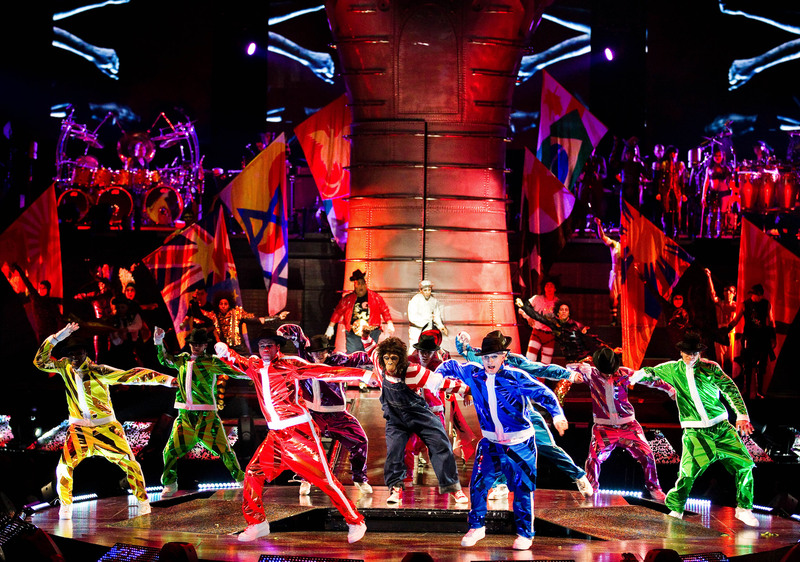 Jointly owned by Cirque du Soleil and The Michael Jackson Company, the show pays a tribute to the late singer, but unlike Michael Jackson ONE, which focuses on the Pop King's music, it is less theatrical and more like a concert, with 49 international dancers giving life to a stunning choreography. The highest grossing Cirque du Soleil show, and one of the highest grossing touring shows of all time, it sold over 100 million tickets since its debut. With an average ticket price of $150 per adult, it generated over $500 million in sales, grossing $140 million in 2011 and $160 million in 2012, with a revenue of approximately $3 million per show.